In a move not seen for 99 years, Phil Woolas, Shadow Cabinet member has been stripped of his election victory by two High Court Judges convened as an Elections Court. Mr Justice Nigel Teare and Mr Justice Griffith Williams found Mr Woolas guilty of illegal practices under election law. Read full Judgement here. The luckless Woolas had the rug pulled from underneath him by Harriet Harman, Labour’s Deputy Leader, when she sought the nearest camera to launch this broadside which appears to have left Woolas with little room for manoeuvre, despite his brave words and his prepared statement read for him by Gerald Shamash. 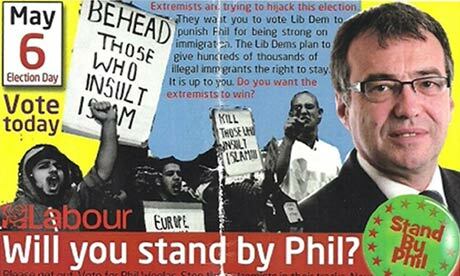 One of Phil Woolas's disgraceful leaflets. It has emerged that the Labour Party Insurers have been paying Woolas’s legal costs, Gerald Shamash, The Official Labour Party Solicitor, does not come cheap. This arrangement is believed to be at an end leaving Woolas high and dry! Astonishingly this disgraced Labour Shadow Minister has launched a financial appeal that he hopes will collect £200,000! so that he can prove his innocence. Some hope, just who is stupid enough to donate their own money to this farcical enterprise? We will see tomorrow whether the Speaker understands what he must do, order a by-election as soon as practically possible. No prevarication, no waiting for Woolas to progress his legal appeals. The findings as to fact will not change no matter what legal stunts Woolas pulls. The people of Oldham East and Saddleworth deserve nothing less! The only thing that sticks in my craw was the sight of Simon Hughes, Liberal Deputy Leader, crowing about the victory. I can remember a certain by-election in Bermondsey in 1983, Labour candidate Peter Tatchell lost to Simon Hughes the then Liberal candidate, after the most disgraceful campaign by the Liberals. Pity Peter Tatchell did not see fit to mount a legal challenge back then. Maybe Simon Hughes would now be nothing more than a footnote to history had he done so! Still got a copy of Peter Tatchell’s book, The Battle For Bermondsey somewhere. It is well worth a read if you are interested in political dirty tricks. STOP PRESS: 8th November 2010, Judicial review rejected. Speaker announces that an expedited application was now in play.